Shirts With Random Triangles: Four-Star QB Prospect Mac Jones Flips 2017 Commitment From Kentucky To Alabama. Four-Star QB Prospect Mac Jones Flips 2017 Commitment From Kentucky To Alabama. From the "What's mine is mine, what's yours is mine" department comes word that Alabama has flipped a quarterback prospect that had been a part of Kentucky's 2017 recruiting class. 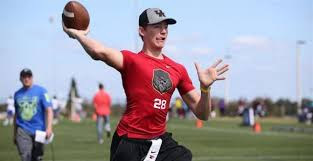 Jacksonville, Florida high school rising senior quarterback Mac Jones flipped his commitment from Kentucky to Alabama on Tuesday. 247Sports grades Jones as a composite four-star pro-style quarterback. The recruiting site ranks Jones at no. 14 among 2017 pro-style QB prospects, at no. 41 among 2017 prospects from the state of Florida, and at no. 284 in its 2017 national composite rankings. Jones attends The Bolles School in Jacksonville, Fl. He stands 6'2, and weighs 180 lbs. He becomes the eleventh member of Alabama's 2017 recruiting class.